People from elsewhere generally think of Mexico as an arid country with lots of cacti. The general impression is that Mexico has relatively little biodiversity in comparison with equator-hugging tropical countries such as Brazil and Indonesia. These impressions could not be farther from the truth. While northern Mexico is indeed arid, many areas in southern Mexico receive over 2,000 mm (80 inches) of annual precipitation, almost entirely in the form of rainfall. The rainiest place in Mexico— Tenango, Oaxaca—receives 5,000 mm (16.4 feet) of rain annually. Straddling the Tropic of Cancer, Mexico is a world leader in terms of climate and ecosystem diversity. It is one of the only countries on earth with arid deserts, dry scrublands, temperate forests, high altitude alpine areas, subtropical forests, tropical rainforests and extensive coral reefs. The multitude of ecosystems in Mexico supports a very wide range of biodiversity. 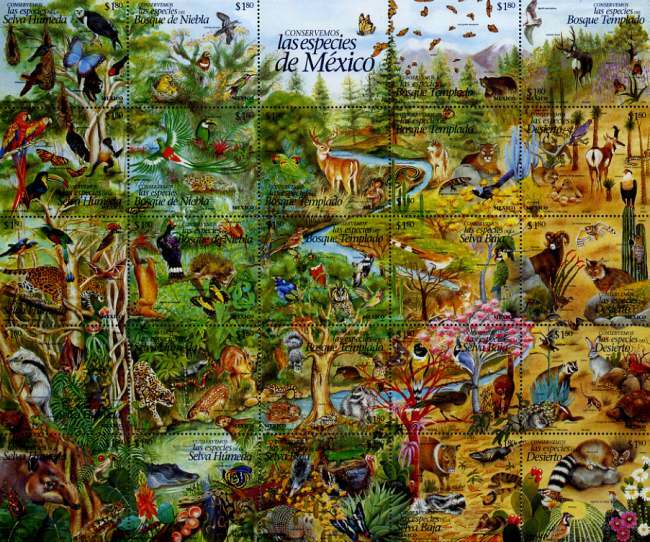 Mexico’s Environmental Ministry (SEMARNAT) indicates that there are over 200,000 different species in Mexico. This is about 10% – 12% of all the species on the planet. About half of all Mexico’s species are endemic; they exist only in Mexico. An unknown number of endemic species were forced to extinction by the intended and unintended importation of Old World species by the Spaniards. The U.N. Environment Programme has identified 17 “megadiverse” countries. The list includes Mexico, the USA, Australia, five South American countries, three African countries, and six Asian counties. Actually, Mexico is among the upper third of this group along with Brazil, Colombia, China, Indonesia and DRC (Democratic Republic of the Congo). The other countries on the list are: the USA, Venezuela, Ecuador, Peru, South Africa, Malagasy Republic, India, Malaysia, The Philippines, Papua New Guinea, and Australia. Chapter 4 of Geo-Mexico: the geography and dynamics of modern Mexico discusses Mexico’s diverse climates. Chapter 5 focuses on ecosystems and biodiversity. Chapter 30 analyzes environmental issues and trends including the impact of Old World species imported by the Spaniards, current environmental threats, and efforts to protect the environment. Buy your copy today to have a handy reference guide to all major aspects of Mexico’s geography! ﻿Some of Mexico’s top hotels have sustainable tourism certification from EarthCheck Which areas of Mexico have the greatest biodiversity?